Pockets are fun! I like the way they allow for including extra items (in this case, an image), and how they engage the viewer to interact with my art journals. The left side of this page is a pocket, and the image of the woman with hat slides in an out of the pocket. I continued the washi tape across the right side of the page, even though the right side does not contain a pocket. I used two different stencils (one on the top of the page, and one on the bottom) to apply Distress ink with blending tools, creating colour, pattern, and interest on the page. I added washi tape to reinforce the spine, and as embellishments elsewhere on the page. The three images on the right side of the book were cut from other pages and reinserted here. 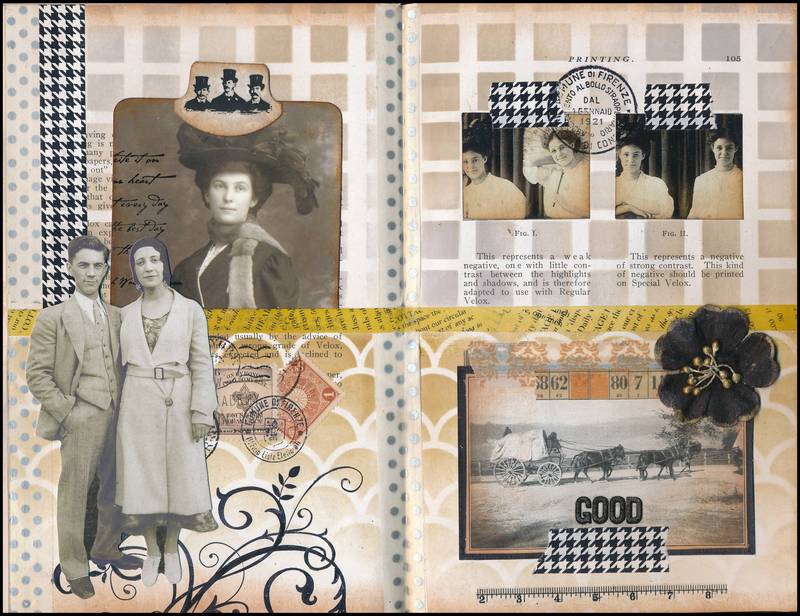 The images on the left side of the page were purchased from the Tim Holtz collection. Rubber stamping, postage stamps, and a fabric flower were added as embellishments. I used rubons for the word “Good” and the three men with hats picture on the tab of the pull-out photo on the left side of the page.